Heat oven to 350°F. Grease and flour 15x10x1-inch baking pan. In large bowl, combine all cake ingredients; beat at low speed until moistened. Beat 2 minutes at high speed. Pour batter into greased and floured pan. Bake at 350°F. for 15 to 20 minutes or until toothpick inserted in center comes out clean. Cool in pan on wire rack for 10 minutes. Remove from pan; cool completely. In large bowl, beat butter until light and fluffy. Gradually add powdered sugar and 2 tablespoons of the half-and-half, beating well after each addition. Add vanilla and additional half-and-half one tablespoon at a time, beating until of desired spreading consistency. To assemble cake, cut cake crosswise into thirds, forming three 10x5-inch layers. Place 1 cake layer on serving plate; pipe or spread small amount of frosting around top edge. Spread 2/3 cup raspberry pie filling on cake. Top with second cake layer; repeat with frosting and pie filling. Top with remaining cake layer. Frost cake with remaining frosting. Knead a few drops of red food color into marzipan until of desired color. Place between 2 sheets of parchment or waxed paper; roll to 1/4-inch thickness. With knife or pastry wheel, cut into 3/4-inch-wide strips. 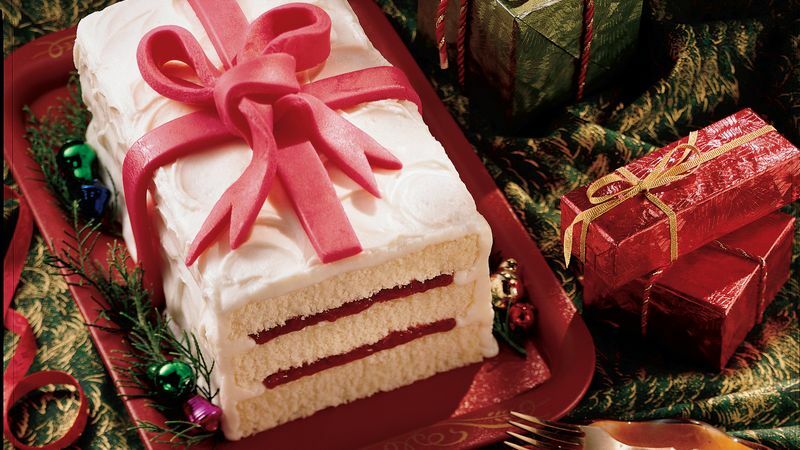 Place strips on cake to resemble ribbon on package; fold additional strips to form bow. Yellow or French Vanilla cake mix can be substituted for the white cake mix. Prepare it according to package directions. Frosting is spread or piped around the edge of each layer before adding the raspberry filling. This keeps the filling from dripping down this side of the cake when the next layer is added. Lightly moisten the counter to prevent the parchment paper from slipping. If necessary, the marzipan can be re-rolled to form additional strips. A pastry wheel is a small kitchen utensil similar to a pizza cutter. Some pastry wheels have a fluted edge that makes a notched cut.